This is the second chapter in the review of our garden in 2014, with thanks to Cathy at WordsandHerbs for suggesting this idea. 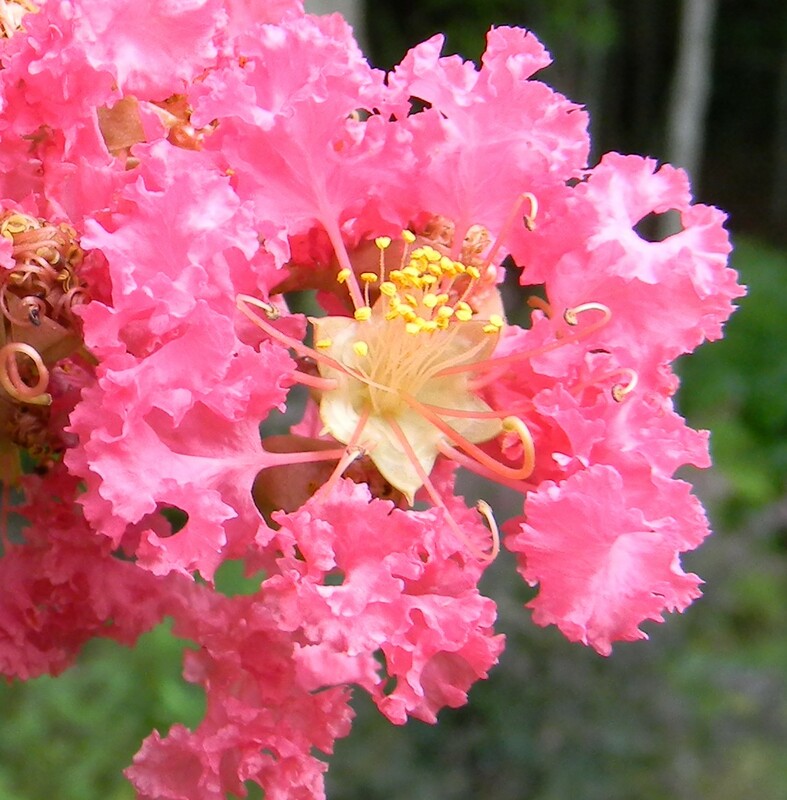 Crape myrtles come on strong in mid-summer and begin to provide tons of color. We have seven crape myrtle cultivars along the periphery of the back garden. 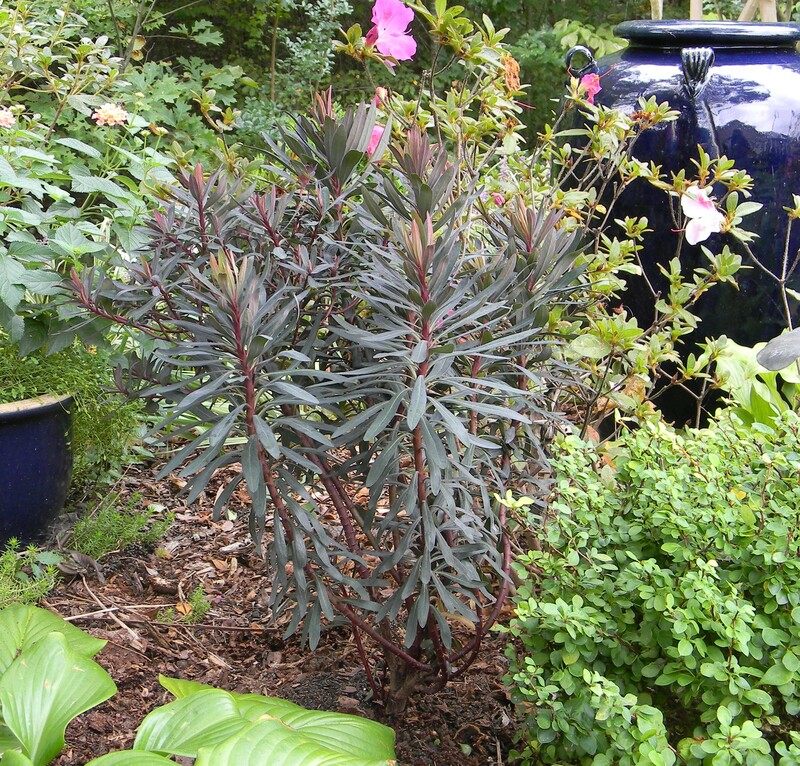 This border is characterized at this time of year by different foliage color and texture. Crape myrtles are beginning to open and the ‘Midnight Marvel’ hibiscus gives a big splash of red. The contrast of the purple crape myrtle in bloom with the lime green of the Berckman’s arborvitae stands out in this part of the garden. I had never looked closely at crape myrtle blossoms. I always enjoyed them en masse and failed to look for the detail. Here are two close up photographs that show the individual construction of the flowers; they are quite lovely…magical. I “discovered” Berckman’s arborvitae at a local home improvement store garden section. I’ve grown to appreciate it greatly; there are now two more in the garden. Their color and form prove to be a nice addition. Their growth has followed the old saw: “the first year it sleeps, the second it creeps, and the third it leaps.” They seemed to do nothing at first, but now that their roots are established they are putting on about 6-9 inches a year. 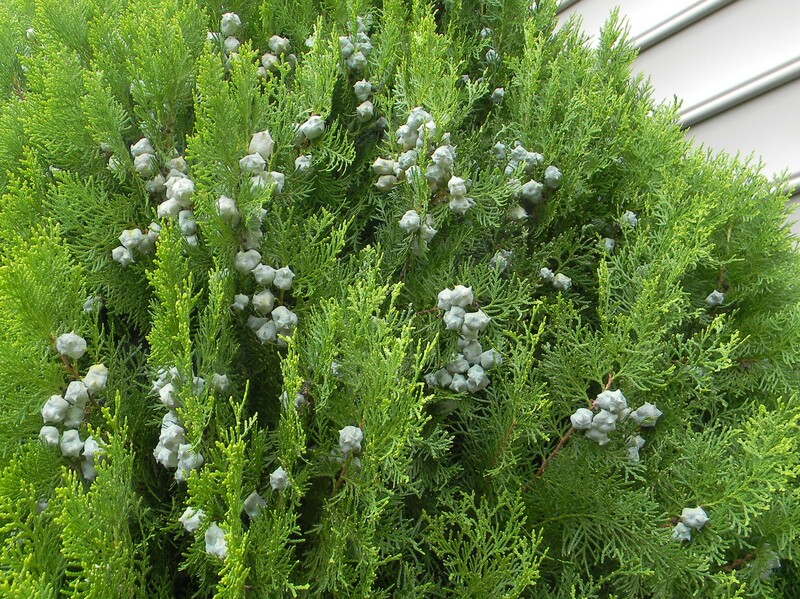 The vertical structure of its foliage is unusual for arborvitae, and its seed pods add another interesting feature. Ninebark is another small shrub with which I was not familiar until I came to North Carolina. 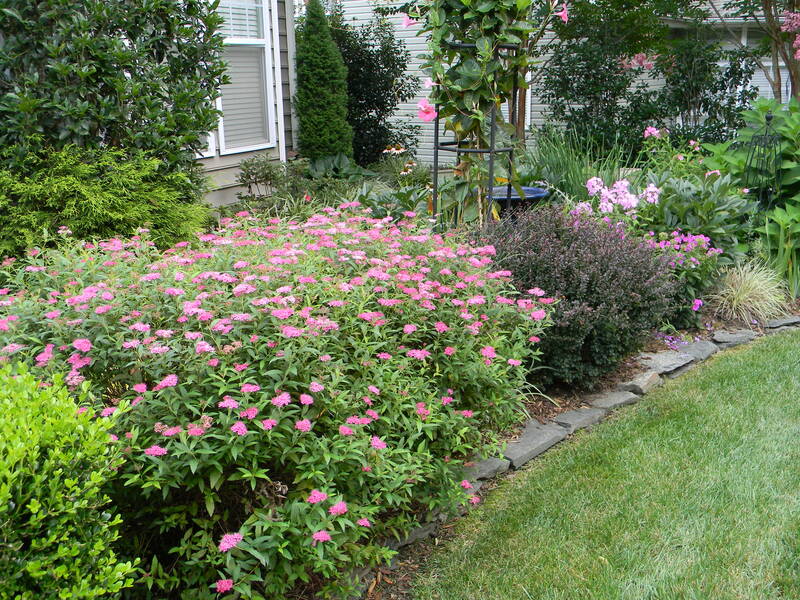 Its pale pink flowers in spring are nothing to write home about, but it adds important foliage color during the summer. It is one of the few purple plants that, for me at least, does not fade to green in the summer sun. 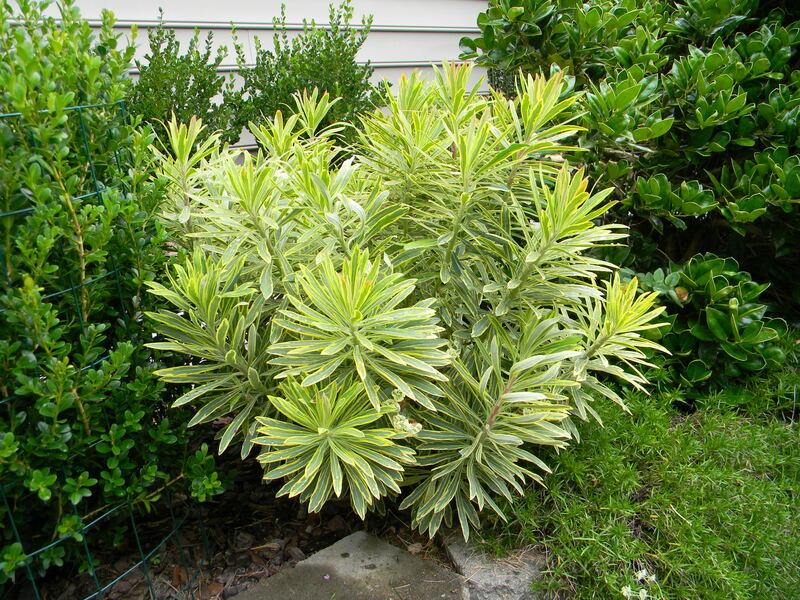 Aucuba japonica ‘Mr. Goldstrike’ has a flower of only minimal visual consequence, but it adds fabulous color with its foliage. The foliage has appeared in many of our In a Vase on Monday offerings through the year. In front is an unidentified dwarf crape myrtle. I bought it thinking it was a named cultivar, but it turned out to be something else. So much for proper labels. I still like it when its pink flowers appear. 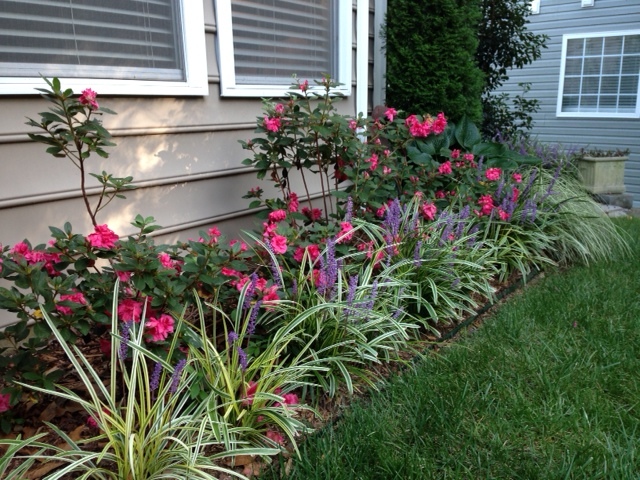 The second round of Encore azaleas in flower coincided nicely with the blooms of the variegated liriope. Knockout roses were originally planted under these bedroom windows, but over time they began to deteriorate as the nearby crape myrtles grew to shade them out. 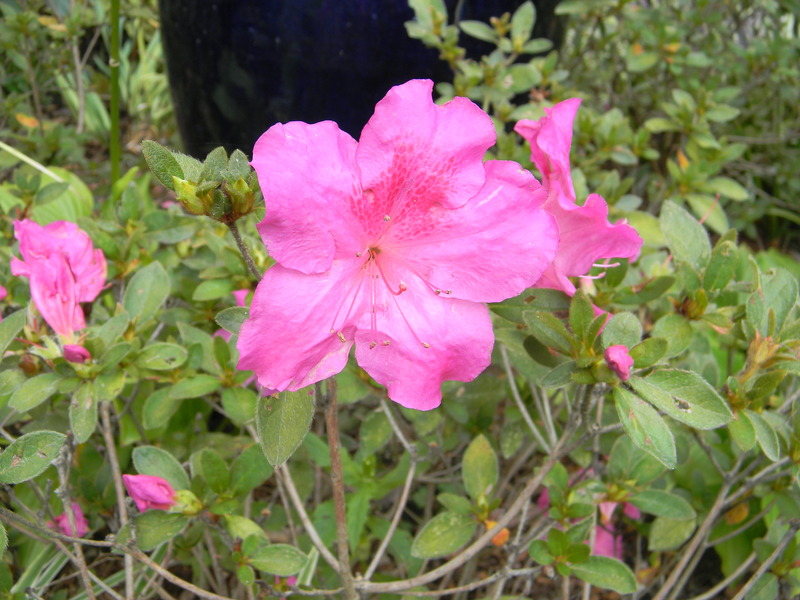 So far, the azaleas have done well here, and I’m pleased with this combination of colors, shapes and texture. An added bonus: much less required maintenance! 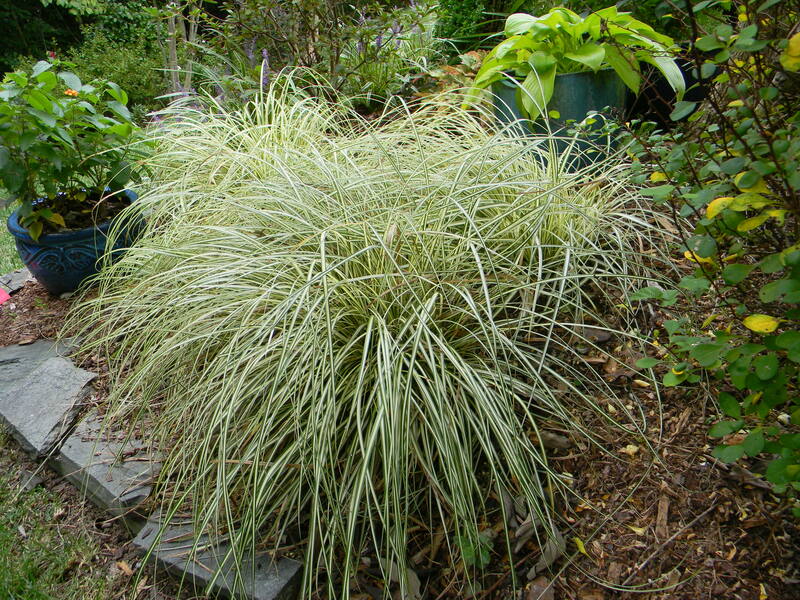 Carex is one of the few grasses that do well in shade. This is a grouping of ‘Evergold’ in the shade of a vitex. 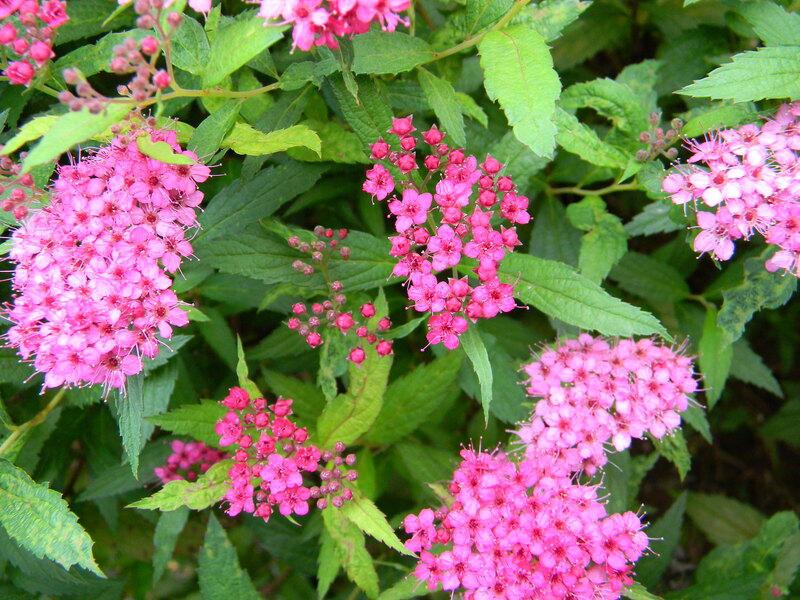 ‘Anthony Waterer’ spirea is one of my favorite plants; there are seven of them in various spots throughout the garden. Their color isn’t splashy, but it makes its presence known. After it blooms in the spring, I give it a haircut and it completely reblooms. This photo shows the second bloom period. In some years (alas, not this one with our early frost), a small third flush can appear in November. I think the contrast with the light green boxwood on the left and the purple barberry at right is pleasing. 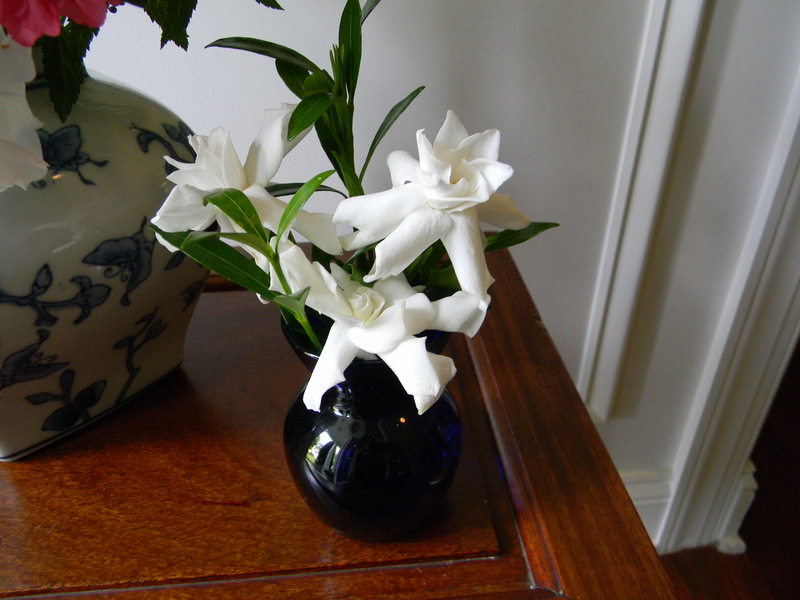 Gardenias are my Arranger’s favorite flower. We were blessed to have a good crop this year. Their prime spot in the house is in a vase on the table next to her bed. 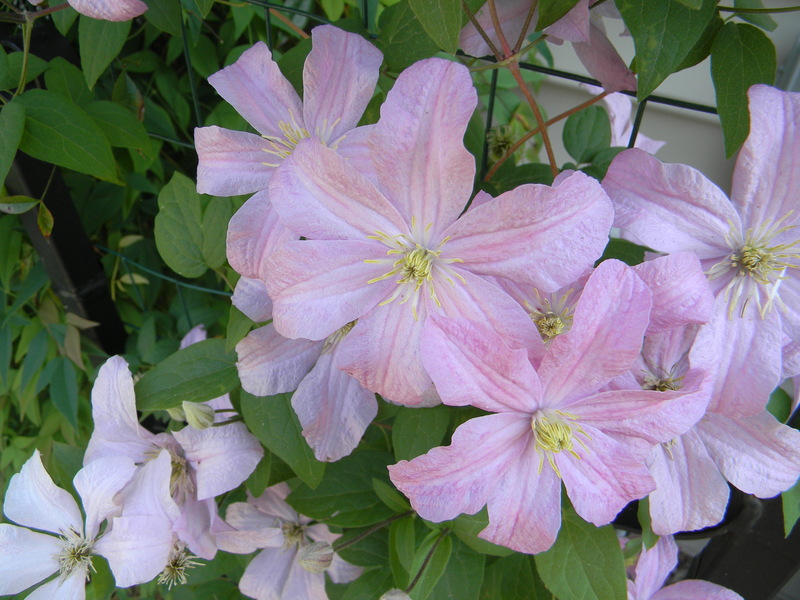 A second sequence of blooms on Clematis ‘General Sikorski.’ I trimmed it back to about 24 inches after the first blooms in the spring, and it came back with loads of color. I can’t say enough good things about muhly grass. It provides a big bang from even a single plant; there are six throughout the garden. Even after they lose their color, the tan seed heads can play a role through the winter months until cut down in about February. This year, tea olive was its most abundant self. The tiny flowers finally made enough show to grab ones attention. 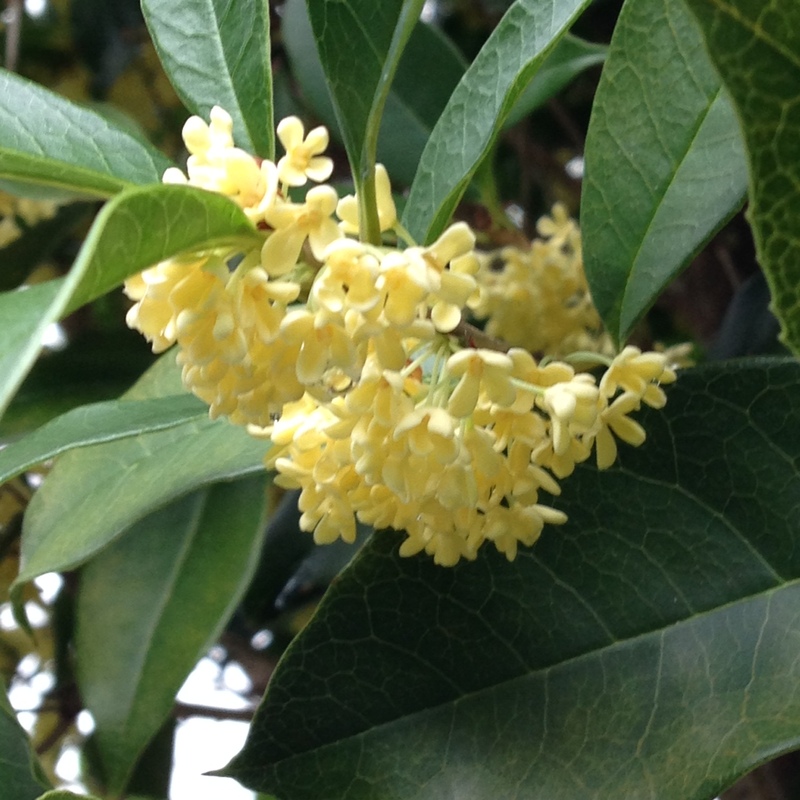 The fragrance from this evergreen shrub is…in a word…fabulous. 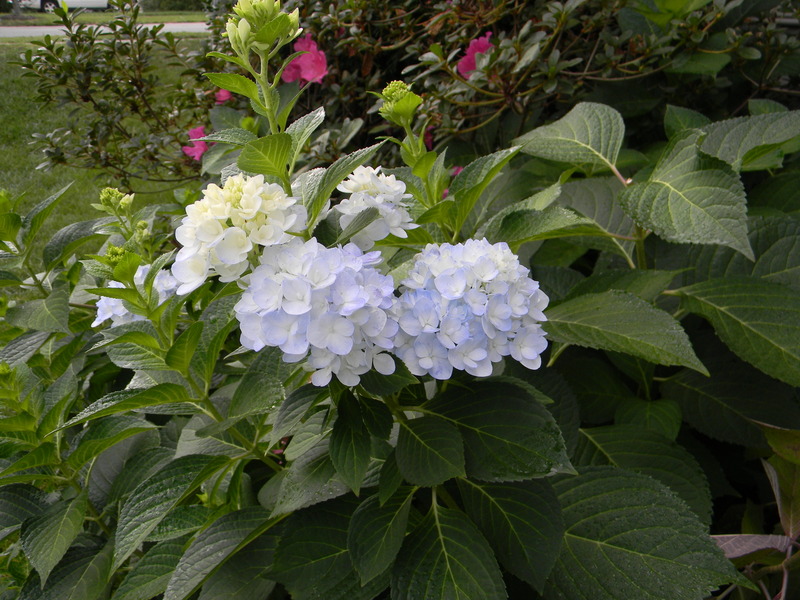 Encore azaleas and ‘Endless Summer’ hydrangeas are marvelous fall plants. 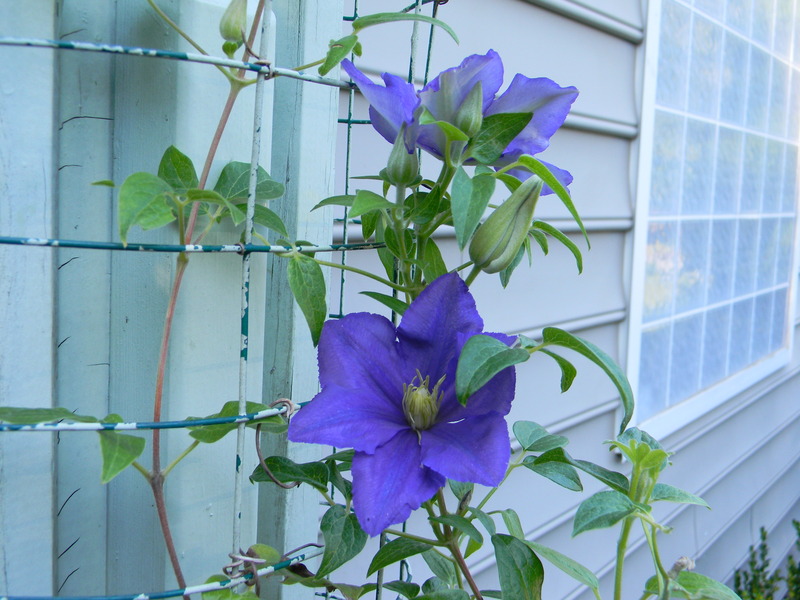 ‘Comptesse de Bouchard’ clematis bloomed again in September. I had two vigorous plants in my Chapel Hill garden which flourished. The is its first year in this garden; I remembered that previous experience and chose it to replace Confederate jasmine which blew over in a winter storm. My hope is that it will flourish in its full sun location and cover the trellis. Again, my thanks to Cathy for her encouragement to organize this review. One more wrap up to go! This entry was posted in Gardening and tagged 'Endless Summer' hydrangea, Anthony Waterer spirea, aucuba, Aucuba japonica 'Mr. Goldstrike', Berckman's arborvitae, carex, Carex morrowii 'Evergold', Cathy, clematis, Comptesse de Bouchard, crape myrtle, crape myrtle blossom, dwarf crape myrtle, Encore azalea, Euphorbia 'Blackbird', Euphorbia martini 'Ascot Rainbow', foliage color, Garden Review 2014, gardenia, General Sikorski, Hibiscus, hydrangea, In a Vase on Monday, liriope, Midnight Marvel hibiscus, muhly grass, ninebark, tea olive, trellis, Variegated liriope, vitex, Words and Herbs. Bookmark the permalink. Its wonderful to see your garden over the summer months. We don’t seem to have crape myrtles over here, maybe we call them something else, do you know the Latin name for them? 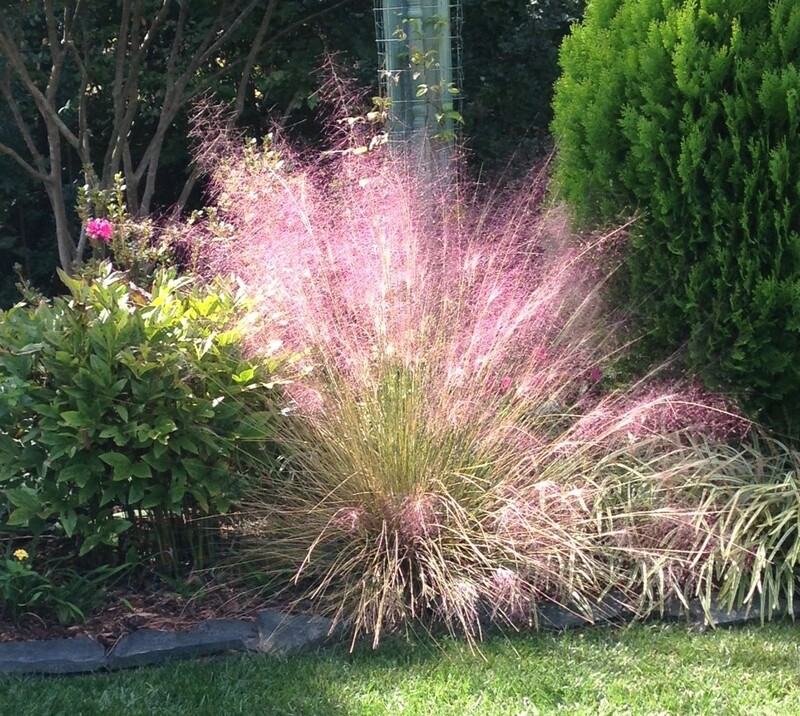 Your muhly grass is absolutely amazing, it looks as though it is decorated with Christmas lights! Thank you, Pauline. 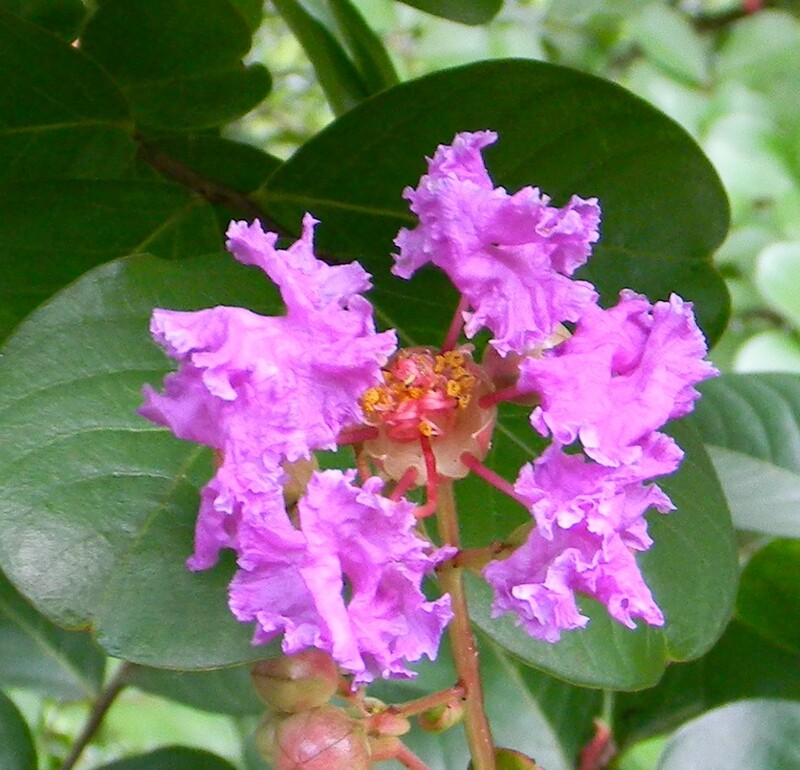 Latin name for crape myrtle is Lagerstroemia indica. You would love them if you can find them/grow them. I don’t think I have ever seen crape myrtles; the flowers are beautiful -yes, magical! And the Hibiscus is fabulous! 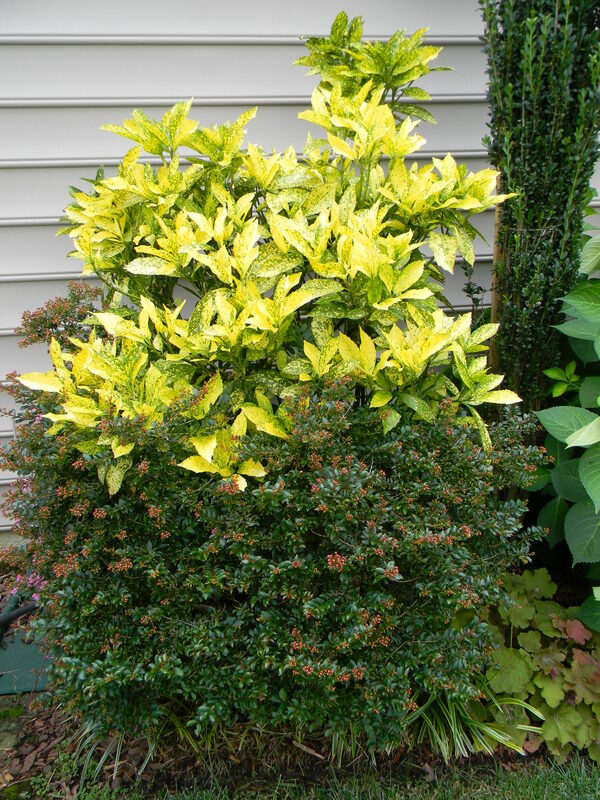 This is such a great review – so many pretty shrubs and contrasting foliage. 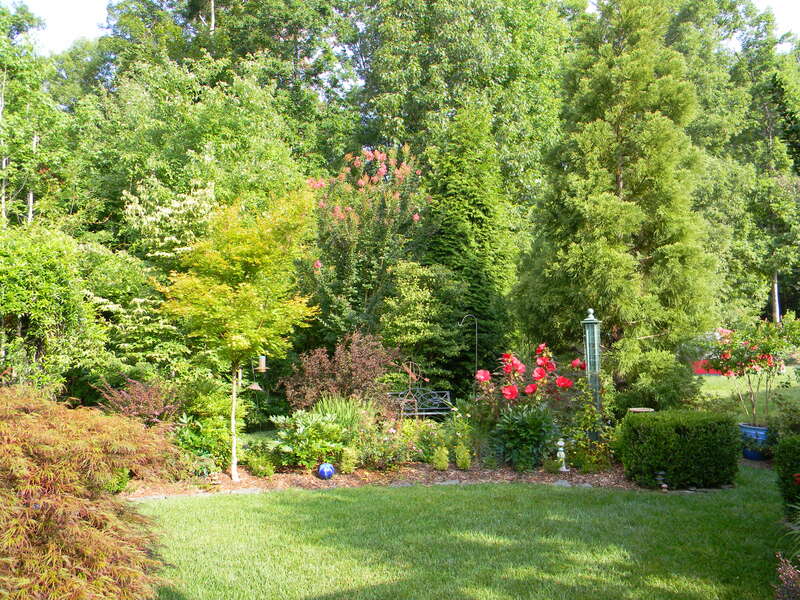 (The arborvitae is very attractive). And like Pauline, I do like the Muhly grass, which I have been trying to track down here for months. It seems it should be hardy enough, but is simply unknown here. I will keep searching as it is so pretty! 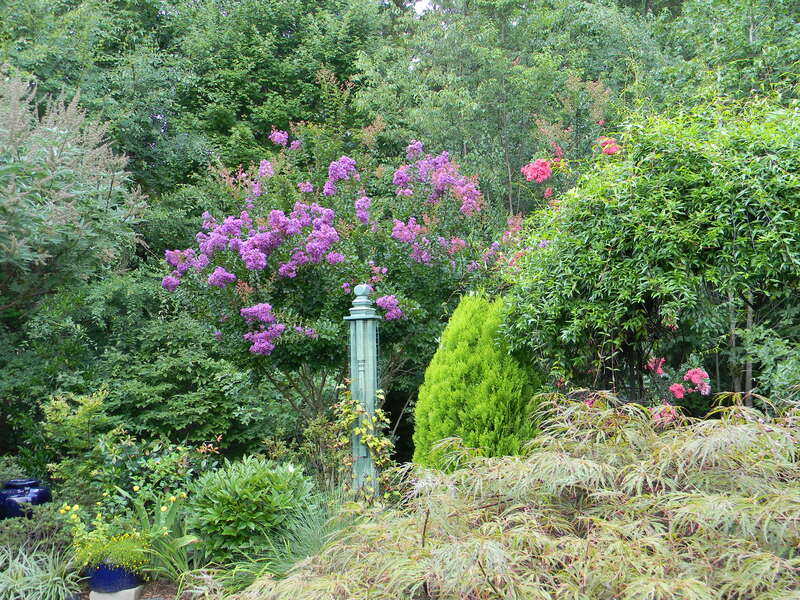 The azaleas and liriope are a nice combination – you have an eye for colour. Thanks for joining again John! Thanks, Cathy. Crape myrtles are in abundance here in this climate. Many cities have crape myrtle festivals which are quite popular. It’s hard to drive anywhere here where there is not at least one crape myrtle in view. There are so many colors. You may want to look for cultivars with American Indian names (e.g., Osage, Tuscarora, etc); they were bred at the US Arboretum and have the reputation of being much more disease resistant than older ones. One more season and one more review to go. I love this idea. Thanks again. You have a beautiful garden John, I’ve just looked your Muhly grass up as its not a plant I have ever grown, I can see why you love it so much. And to be able to grow Gardenias outside must be quite thrilling. Thanks, Julie. I didn’t realize you had to grow gardenias inside. That should concentrate the aroma, however. I hope you can find muhly grass. What a beautiful and well tended garden. All pics are great but I do love the 2nd one – gorgeous scene! Thanks, Annette. I am slowly learning some things about photography. The scene you mentioned is one of my favorites, especially when that crape myrtle is in bloom. Great garden John. 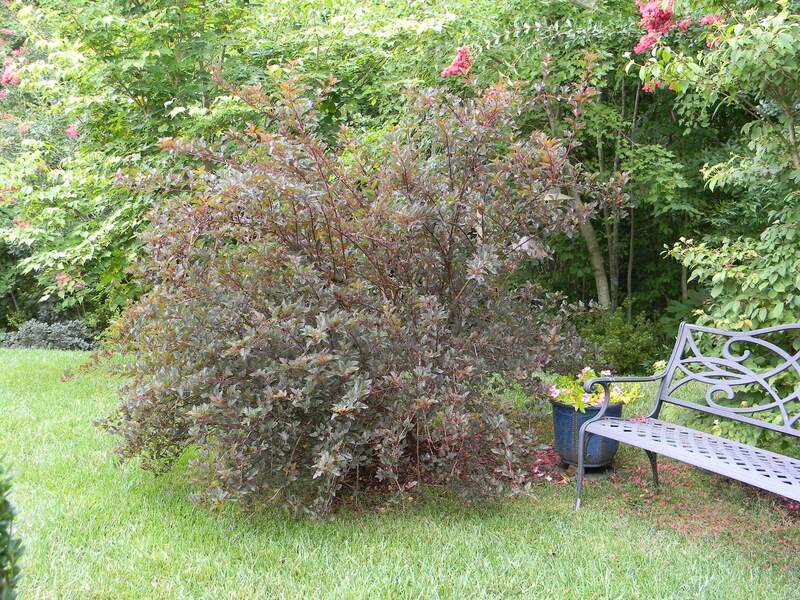 I like the color of your crape myrtle very much and am going to have to look for Berckman’s arborvitae. Thanks, Susie. I will keep my eye opened for the arborvitae here and let you know if I find one. I have only seen them at Lowes.